At most of the occasions, we completely forget the freshness of flowers when we use the flower for decoration. So, preserve the flowers for a long time is essential. If you want to maintain and keep them fresh for a long time, then you have to deal with them in appropriate conditions carefully. It is crucial how you to treat them when you bring them. Flower specialists can give you the best information and experience to choose them for you. You need to counseling with flower specialists. While in this article, I am trying to share a few useful and simple to preserve bulk Royal Blue Roses for your event. For occasions like weddings, we like to purchase low-cost flowers as we need flowers in large numbers. To keep fresh and preserve such a large number of flowers is a difficult task. However, you can follow these flowers in making bunches and in boxes. After that, you can leave these flowers in various vases. It will look stunning if you arrange these vases where you are celebrating the event. However, to preserve the flowers, firstly clean the vessel with hot water and fill it with fresh water. Always keep the leaves from below the water level as it can cause bacterial growth. You need to know that if you keep the roses in the water for a long time, then you will notice the bottom of stem completely die. As in this way it is challenging for cells to absorb the water that’s why lower part of stem get to kill. If you want to avoid it, firstly cut the stem by 2-3 inches at an angle from the bottom as in this way tissues can easily absorb the water molecules. Thus cutting off stem is a useful technique to save flowers for long-term. It is an ideal way to preserve all type of flowers, not just Royal Blue Roses. With the use of silica gel, Epoxy raisins, and few home remedies, you can easily preserve roses for long-term. Epoxy raisins will enable roses to save their unique color and to protect while silica gel will allow you to keep upright the texture and shape of the roses. You can keep fresh and healthy roses with common household accessories such as vinegar, bleach, sugar, fade and fresh water. The protection procedure is advantageous and works magnificently for the bulk flowers. Ses also: What Does Fennel Taste Like? You often notice that flowers absorb water excessively quickly, to keep them fresh and healthy you have to change the water after 2 to 3 days. 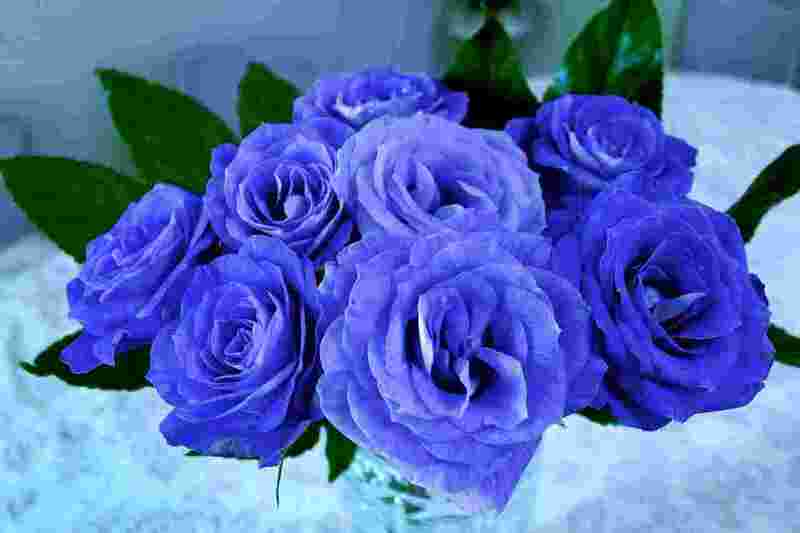 For bouquets of royal blue roses, you should ensure that water does not irritate the setup of the roses. You should also add nourishment packet of bactericide which assists the water in remain flowers fresh for long-term. You need to know that always keep the flowers away from Sun UV Rays, heat, and high temperature. Place the roses where the temperature is average, it should be around 65 to 70F. Sun Rays encourage flowers to fade early and as well may die them very soon.